Head protection must be worn in this area. Eye protection must be worn in this area. Hearing and eye protection must be worn in this area. Respiratory protection must be worn in this area. Safety footwear must be worn. Site rules –No children allowed onsite, all persons working onsite must have a General Safety Induction Card, and electrical leads and power tools must be tested and tagged. All the signs mentioned above are available in a standard size of 600mm x 450mm, while the 4-in-1 safety sign comes in a standard size of 900mm x 600mm. If you fail to put up safety signs on the construction site, a maximum fine of $1,100 will apply. So before you begin any building work, don’t forget to put up the signs, as these will ensure that the site meets health and safety standards. Putting up signs that warn people of hazardous activities onsite can also ensure that the building process goes smoothly and within budget. 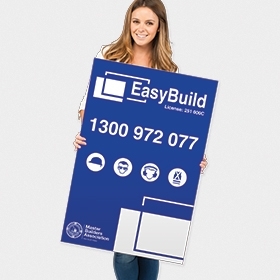 Quality Construction Signs made from 5mm thick Signflute™ with full colour digital print. Produced in just 24 hours and delivered anywhere in Australia for only $14 inc GST!